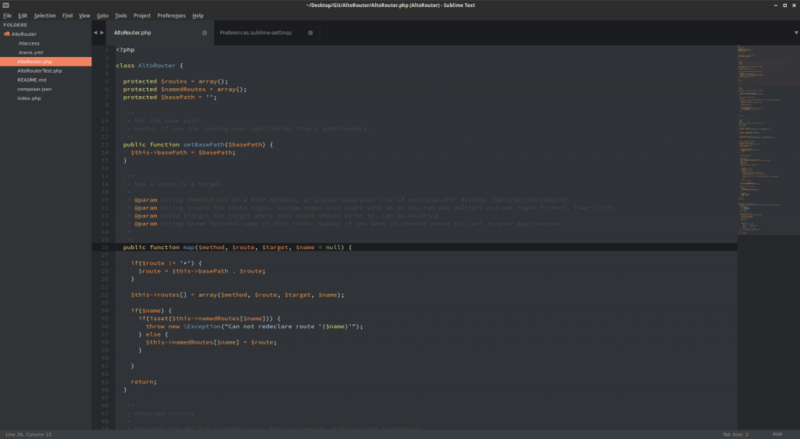 This post simply contains links and images for a LOT of Sublime Text themes. Most work with Sublime Text 3, even though they may say they’re only for Sublime Text 2. People are bad about updating their GitHub readme files sometimes. Clicking the theme name will take you to it’s GitHub page, while clicking the image will just show you a bigger version. Got a decent Sublime Text theme I haven’t listed? Please leave a comment with the theme name and GitHub URL if applicable. I’d really like to try making a mostly complete list of Sublime Text themes that are current and not ugly as hell. Really happy to see Minimal color scheme here because it’s often forgotten and is very usable with near-perfect contrast and syntax highlighting. Also, you should point if they’re Themes or Color Schemes or both. @disqus_tSU5TLoEgT:disqus I tried to keep this list to strictly THEMES. A few of these themes also include schemes, but for the most part, all of these are actual Sublime Text themes. Added! At the end. I dig that theme! Thanks for introducing me to it! What is the theme in the header image? Glacier, one of my favorites. It would be awesome if you made some mention of how broad or varied the scope coverage of each theme is. Some themes look nice in a stock screenshot but if they only cover a dozen or so scopes then they are a lot less useful and functional than another theme with more coverage. I love your Sodarized theme! Thank you! FYI, when you extract it, it doesn’t give it the right folder name. I had to rename it for it to work.